From left to right are BFPD’s Engine Boss Jerry Fletcher, Colorado State Engine Boss Michael DiCristina, BFPD Fire Fighter’s Jim Thompson, Ryan Nelson, Engine Operator Shane Prim, Engine Operator Jesse Treat and State Fire Fighter Michael Manzo. Five firefighters of the Berthoud Fire Protection District and two State of Colorado, Division of Fire Prevention and Control firefighters were deployed on two Berthoud Type 3 fire engines to the Whites Fire, east of Sawyer Bar, California on Friday, August 1, 2014. The Whites Fire is located in Siskiyou County, California within Klamath National Forest. The Whites Fire has been included in the July Complex along with two other fires within close proximity, the Log Fire and the Leef Fire. As of Tuesday, August 5, 2014 there were a total of 587 firefighters combating the three fires that has consumed more than 6,897 acres. On July 29, 2014 a storm moved across Siskiyou County with little moisture and a significant amount of lightning. A total 955 lightning strikes were recorded. As of August 1, 2014 the lightning had resulted in at least 26 lightning caused Wildland fires. Currently there are 19 active fires burning in California. The Berthoud Fire Protection District has consistently maintained a deployable force of seasonal Wildland firefighters and Wildland fire fighting fire engines to respond to regional, State and national Wildland fires. Recent deployments included West Fork Fire, Royal Gorge Fire, Fern Lake Fire, Black Forest Fire, Red Cow Fire, East Fork Fire, Estes Park Fire, High Park Fire and Sawmill Canyon Fire. 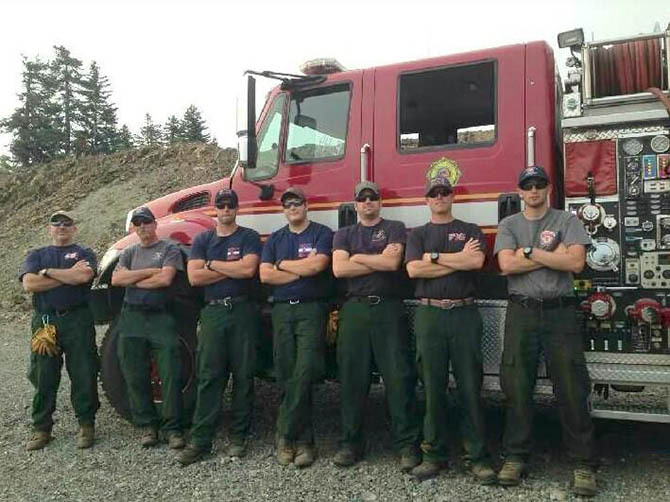 The District has deployed Wildland firefighters and fire engines to states within the Pacific west, southwest, Rocky Mountain and southeastern states.